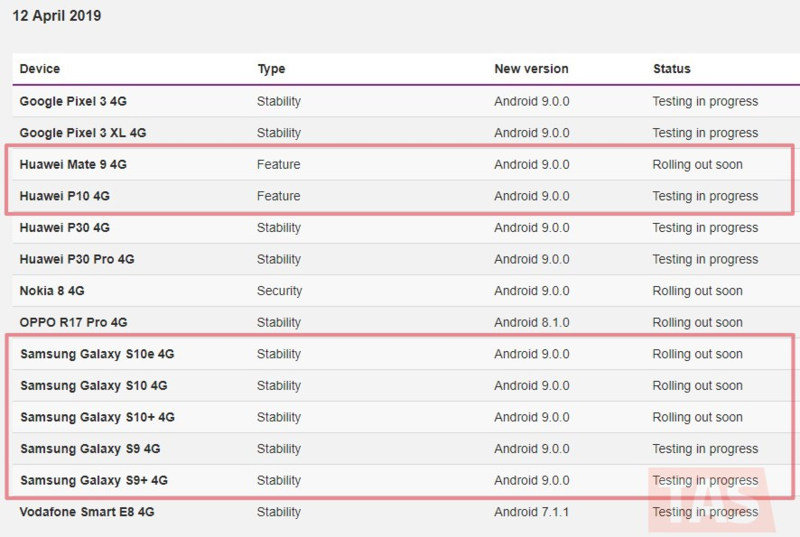 Vodafone Australia has shared new information regarding software updates on their website for Android devices. Thanks to which we now know more about the status of Android Pie rollout for the Huawei Mate 9 and P10 handsets, as well as bug fixer updates for S9 and S10 handsets. In the screenshot above, you can see that the carrier plans to release the Mate 9’s Android Pie soon, while that for the P10 is still under testing. Though, if you own a Galaxy S10, a bug fixer update is headed your way. The update has cleared the testing stage for the S10, S10+ and S10e, and would be available as an OTA soon. We figure this is the same update that improves the performance of the camera and fingerprint sensor on the device. The Galaxy S10 update may also pack security patches for the month of March. Similar update has been released globally, as well as in the US. Samsung also released a small update to patch biometric apps on the Galaxy S10 recently. Galaxy S9 and S9+ users can look forward to receiving an update too, probably carrying March 2019 security patches. The carrier has marked the upcoming update for the S9 sets as ‘Testing in progress’ which means we are still a few weeks away from the release.